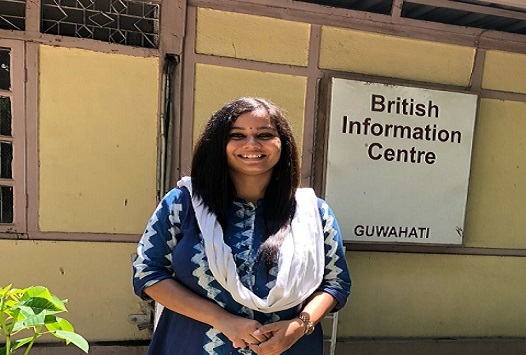 Shristi Goswami of Guwahati has been selected for the prestigious Chevening Scholarship 2017-18 to pursue her one year Masters in Human Rights Law at SOAS, University of London. A budding activist, Shristi’s focus is on human rights and feels strongly that every child must be introduced to his/her rights from early years. She is excited that she would meet professors ,activists and NGOs who have been working on this subject in the UK and gather from them information so that she can make a conducive curriculum on Human Rights ,which may be introduced from primary/middle school level in India. A topper in Humanities from Donbosco School, Shristi did her Masters in sociology from TISS Guwahati and PG Diploma in Liberal Studies as a Young India Fellow in Ashoka University Sonepat. She has worked for Sajha for Mission Buniyad,initiated by Delhi Govt,Star India Pvt Ltd as a creative associate and helped Sangram,Guwahati in conducting workshops on human rights. Shristi is also a Kathakali dancer and she has packed her saree and accessories, should there be a chance to perform during her one year stay in the UK.